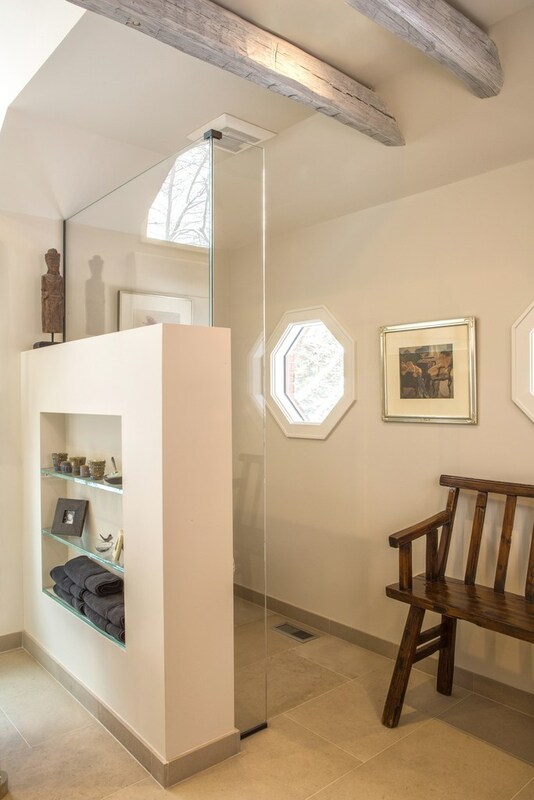 When architect Mark Eric Benner stepped into an outdated master bathroom, he bridged the homeowner’s vision with the designer’s concept. Uniting the two, he reinvented this 1970s bathroom. At this sizable lake-view home in Northbrook, Illinois, interior designer Rebecca Pogonitz, of GoGo Design Group, developed the concept. Because the clients struggled to understand 2D drawings, she asked Mark to help them go a step further. 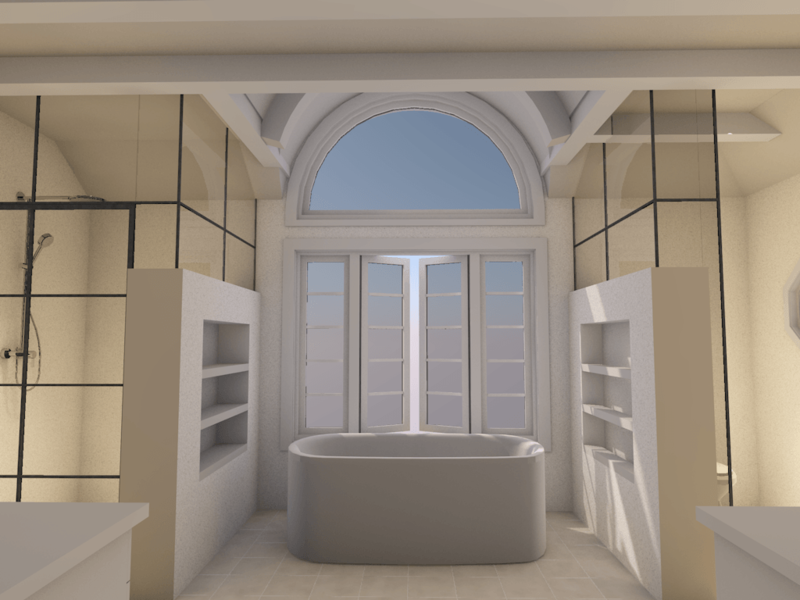 Through his 3D presentation, the clients were able to virtually walk in their dream space – visualizing this 1970s bathroom as a rustic spa-style retreat. The clients referenced the 3D renderings when communicating with construction workers and tradesmen. “It gave them a conduit for communication,” he says. The project started in June 2016 and was completed, rather quickly, in July 2016. The clients felt eager to see their bathroom designed and built in a short time frame. Luckily, Mark and Rebecca provide an informed process, unburdened by superfluous details. “This is an example of a lightning strike project,” he says. Essentially, the clients wanted to open up this boxy, compartmentalized bathroom. They desired a clean, airy, natural environment – to which Mark responded by raising the ceiling. The barrel vaulted ceiling was paired with rustic, reclaimed barn beams with a white glaze finish. Through French-style casement windows, natural light warmly bathes the space. Since the original built-in bathtub was cumbersome, the team replaced it with a freestanding tub in a nook separated by monolithic partitions. While the partitions define the bathing area, the tub nook still flows within the open plan showcased as the focal point of the whole room. What was once a traditional collection of small bathroom spaces becomes an open retreat – a single environment that’s coordinated, but still serves all the original purposes. This project is a testament to effective collaboration between an architect, designer and their clients. Mark and Rebecca often work together on projects, expressing a deep appreciation for each other’s talents. “Everyone had a clear understanding of construction and design goals,” Mark says. Mark’s role was to bring it all together. After understanding the designer’s concept and the client’s wishes, they collaborated using unique materials. He picked up the barn beams himself, excitedly returning to create the decorative ceiling design in his mind. In the end, the clients have fallen in love with their new bathroom.